At this mold type contractions gas vent very important, to prevent product burning and unfill (shot mold), see at those picture between gate position and top product distance is to high, base on my experience more than 10 mm plastic material can not fill until top of part (shot mold), although it depend on thickness of product, this product have thickness only 0.5 mm in each side, they are various ways to make gas vent for pin construction, picture below shown the other one. 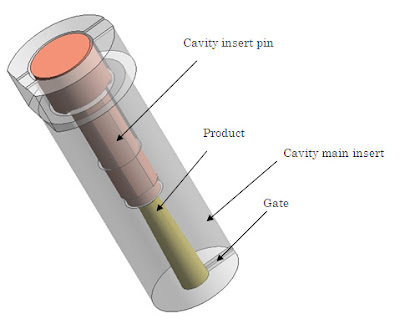 At the top of product we cut to make gas vent land, give distance about 5-10 micro mm, see picture below, P1 as pin length have maximum length 19.992 mm (orange color) mm and P2 hole at the grey pin have length 20.000 mm (grey color), so distance between other is only 8 micro mm, gas can exit with this distance but plastic material can’t fill at this distance, almost plastic material in injection process, can fill if 20 mm space available, it cause plastic product defect that called flash. 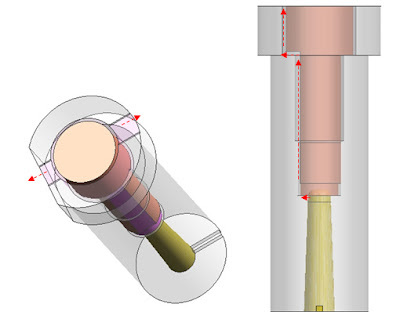 At second picture, gas vent groove release at cavity main insert pin, gas vent groove depth is about 0.1 – 0.5 mm. 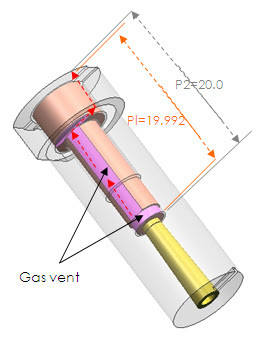 when designing gas vent the important point is make sure that gas can release to out of mold. 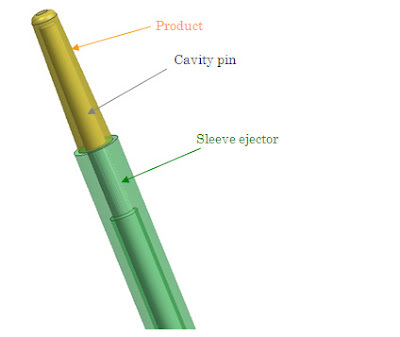 The main part of cavity insert is only cavity pin, because this product can be formed only by pin at the cavity side (see picture below), cavity pin located at center of product (grey color), product color is yellow, don’t forget to make some taper at this pin. bisa ga ya dapatkan sample projek bagaimana pembuatan mold atau tutorialnya free .....? Hello Android & iPhone users. if you are planning on working on any home improvement/construction projects, then be sure to check out our portfolio of home improvement/construction apps. We have 6 dedicated Android & iPhone apps for Home Improvement projects. Our apps will help you with Drywall, flooring, Carpet, Paint, Concrete, Heating, Insulation, Air conditioning.